The Educational Procurement Journal is our quarterly magazine that highlights issues relevant to the procurement profession. 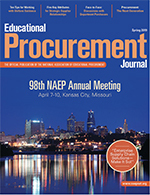 In addition to being a printed publication, the Educational Procurement Journal is also available in an interactive online format for ease and convenience. Click on any of the links below to visit the corresponding Educational Procurement Journal page. Our current issue is the Spring 2018 issue.